Looking for a retro birthday gift for someone who loves sweets and a little throwback style? Surprise them with this adorable cupcake holder idea from Randi at Dukes & Duchesses. For her retro birthday gifts, Randi uses vintage jello molds that she scores at the thrift shop for less than a buck apiece. It’s the perfect way to take homemade goodies up a notch and give someone a kind gesture. “Every month brings about special birthdays,” she says. “I’m often looking for a simple and personal way to celebrate the birthday of a friend, a coworker, or even a neighbor. A little tulle and a candle, and this retro birthday gift is ready to give! This could be an extra-special way to honor the birthday of a grandma, grandpa or great-aunt. Mix up an old family favorite dessert recipe and serve it with some snacks on a candy-stripe platter. While you’re at it, put in a time-honored movie and pop up some popcorn for a memorable celebration. You could even create a slideshow featuring highlights from birthdays past. The perfect pairing for this old-fashioned goodie, of course, is another birthday favorite. Teleflora’s Fun ‘n Festive Bouquet offers up a bursting presentation filled with classic favorites like orange roses and red carnations. The keepsake mug adds to the festivity with a piece that will be cherished in your giftee’s home or office, right alongside those vintage jello molds. “Flowers are a gift and decor all in one and add such a festive touch to any occasion,” Randi says. They’re the perfect accompaniment for a birthday surprise, and they can even be sent straight to your loved one if you can’t be there in person. Check out the full tutorial for Randi’s easy gift idea over at Dukes & Duchesses. 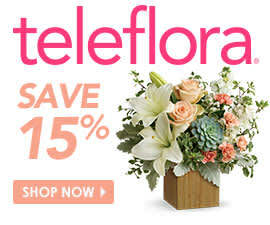 Shop for birthday flowers today!